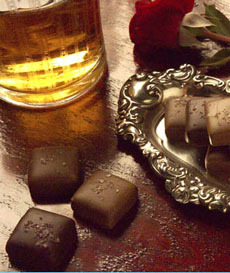 Fine confectioners like Woodhouse Chocolates make caramels sprinkled with fleur de sel. Photo courtesy Woodhouse. This is Page 3 of a 7-page glossary of the types of sea salt and other culinary salts. Some of the terms you’ll find below include fleur de sel, French sea salt and grey sea salt. After you’ve read up on salts, take a look at our other food glossaries—an easy way to get up to speed on almost 100 different food categories. This glossary is protected by copyright and cannot be reproduced in whole or in part. Top-quality salts that are known for their unique textures, which allow them to quickly dissolve when applied to finished dishes. These include flake salt, fleur de sel, and French sea salt. Like fleur de sel, this “flower of salt” is so-named because the delicate salt “flowers,” or crystals, comprise the top layer of the salt pans that rest on the surface of the sea. Fior di sale comes from the Trapani area of Sicily, and is harvested by master salt makers. Fior di Sale can only be harvested on windless mornings, when the surface waters of the Mediterranean are unruffled. 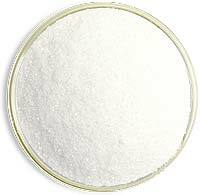 Fior di sale is a very white crystal with a much lower percentage of sodium chloride than regular table salt and rich in fluorine, magnesium, potassium and all the trace elements contained in sea water. Fior di sale. Photo courtesy SaltWorks.us. 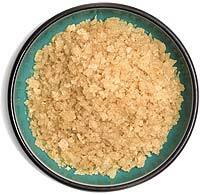 Flake salt has a delicate, sweet flavor with good taste, not too strong or salty. A finishing salt, it should be sprinkled on salads, tomatoes, fish, to finish roasts and sauces, on buttered bread and bruschetta. 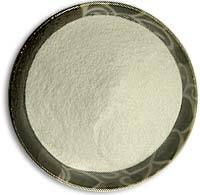 It is extremely soluble and will dissolve even on cool foods. A light crystal salt reminiscent of snowflakes. Seawaters are evaporated by the sun and wind producing salt brine that is slowly heated to the point where delicate pyramids shaped crystals of salt appear. The finished product is light, flaky sea salt. Flake salts are harvested all over the world: the Maldon River in England, Anglesey off the island of Wales, New Zealand, and Australia. The pink flake salt shown here comes from Australia’s Murray-Darling River Basin, where a red pigment, carotene, is secreted by algae. Flake salt. Photo courtesy SaltWorks.us. Salts can be smoked or otherwise flavored by mixing them with spices (saffron), herbs (bay leaf, fennel, thyme), berries or other seasonings like truffles. Complex blends can be found, including those that mix sea salts with regionally-themed spices and herbs to create “Mediterranean” or “Southwestern” blends. The salts usually have a lot of visual appeal on top of foods and as plate garnishes, and the whole is greater than the sum of the parts—i.e., because they are crafted for beauty, they make a better presentation than a home cook would achieve by combining sea salt with the same ingredients from the spice cabinet. Read our review of Ritrovo flavored artisan salts and Fusion seasoned salts and what you can do with them. Fusion seasoned salts come in more than a dozen flavors, from black truffle to merlot. 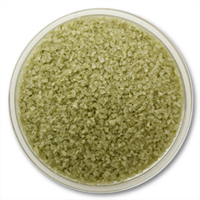 Shown above, matcha (green tea) flavored sea salt. Photo courtesy SaltWorks.us. French for “flower of salt.” Like sel gris, it is also raked by hand from the salt ponds (“fields”) of the village of Guèrande, Brittany, on the coast of France. It is harvested from May to September; artisan paludiers patiently wait as the shallow pools of water evaporate, creating the precious salt crystals. The salt rises to the top of the water, forming delicate flakes that, upon drying, are off-white and can acquire a pinkish hue. The slightest movement will cause the “flower” to sink to the bottom, so salt can only be collected when the weather is warm and the sea is calm. For every 80 pounds of sel gris produced, only three pounds of fleur de sel is harvested. Fleur de sel. Photo courtesy SaltWorks.us. Long prized by chefs and gourmets for its high quality, fleur de sel provides a very delicate and somewhat earthy flavor and a delightful crunch; it is less salty than most salts. Like sel gris, it is an excellent cooking and finishing salt, smooth with a light crunch. Sea salt harvested from pristine Atlantic seawater. Unlike most American sea salts, they are usually unrefined, so they retain more of the trace minerals that naturally occur in seawater, including natural iodine. They are ideal for salads, cooked fresh vegetables and grilled meat. Fleur del sel and sel gris are just two examples of French sea salts. French sea salt. Photo courtesy SaltWorks.us. Smoked sea salt. Different producers make smoked sea salt. The smoky flavor will pick up hints of the wood or other material over which the salt was smoked. The salt below is Fleur de Sel smoked over Chardonnay oak wine barrels, achieving a gentle smoke flavor with a savory hint of wine. See also smoked salt. A seasoned salt that is one part garlic powder and three parts regular salt, commonly used as a flavoring to make garlic butter, to season garlic toast and to flavor other foods. Smoked sea salt. Photo courtesy SaltWorks.us. 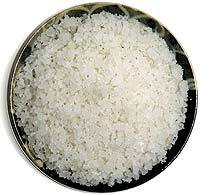 Sea salts typically evaporate into coarse grains, but they can be ground to create fine-grain and medium-grain salts. Fine grains (the texture of table salt) mix easiest into recipes; coarse grains provide beauty as a garnish and crunch on the palate. To serve sea salt at the table, you can put coarse-grain salt into a salt mill or pepper mill; or grind it in a spice grinder. We use the Sharpshooter Battery Mill from WmBoundsLtd.com; the two different colors enable us to grind two different types of sea salt. 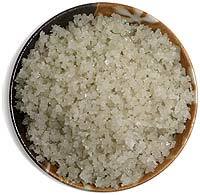 Also called sel gris and Celtic salt, a “moist” unrefined sea salt found along the coastal areas of France. Its light grey color with purple tinge comes from the clay found in the salt flats. The salt is collected by hand using traditional Celtic methods. Grey salt is considered by many to be the best quality salt available. Grey salt. Photo courtesy SaltWorks.us. Large dry salt crystals suitable for a salt mill or grinder. Their lower moisture content allows the salt to flow through. Used for flavoring foods at the table when a finer, higher grade finishing salt is not required. Note: Unlike pepper mills, salt mills should have a ceramic or plastic grinding mechanism. Metal, including stainless steel, will be corroded by, and adversely flavor, the salt.